Imagine hearing, “It’s cancer,” come across a desk at you. Now imagine that the doctor is speaking about your child. Although it may be impossible to wrap your head, much less your heart, around these words, they’re a reality for many parents each year. Cancer is one of the leading causes of death in children and adolescents. Childhood cancers differ from adult cancers in many ways. For example, there’s no general prevention or screening for childhood cancers, and the vast majority of cancers in children have no known cause. Thanks to medical and technological advances, more than 80% of those diagnosed with childhood cancers now survive. But survivorship can bring substantial long-term effects from the cancer itself or its treatment. Kids’ growth, motor function, cognition, and more can all be affected, as can their ability to simply play and participate in physical activity. 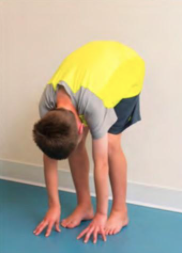 Having been involved in a pediatric cancer and yoga research study, I know that parents feel reassured when those providing the yoga instruction are well-trained and medical teams are on board. To me, these elements are key to ensuring that children receive the most benefit from their yogic practices. It’s important to note that no serious or negative outcomes have been reported in the current literature, even in immunosuppressed children who took part in physical activity while undergoing cancer treatment. Not only are they safe, but play and activity can mitigate some of the effects of cancer and treatment. Furthermore, physical activity—including yoga asana—has been shown to help create a sense of normalcy for children undergoing treatment. The best part of my involvement in the research trial was seeing these courageous children after class. Their moods were lifted, their confidence boosted, friendships with peers strengthened—and they’d had an opportunity to return to the playful nature that children should never be robbed of. The risks of a sedentary lifestyle negatively affect all children but can be even more pronounced for children dealing with cancer. By supporting kids to maintain physical activity, including yoga, the severe effects of treatment as well as comorbidities can be reduced. Above all, we can provide children an outlet to simply be children again during a challenging time. Let’s encourage kids to be active and help show them that cancer doesn’t get the final word. Tyla Arnason, C-IAYT (The Yoga Effect, @YoginiTyla), has worked with the cancer community since 2007. Tyla develops yoga protocols used in research for Dr. Nicole Culos-Reed and trains teachers to work in the therapeutic program Yoga Thrive.